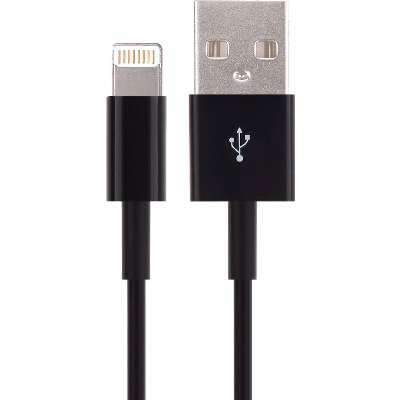 For iPods nano 7th Generation/touch 5th Gen./6th Gen.
Connect all your Apple iPhone, iPad, or iPods with our 8-pin Apple Lightning connection to your computer's USB or higher port, for fast syncing and charging. 4XEM's 15FT or 5M Black 8-pin Lightning to USB cable can be paired with the 4XEM USB power adapters, 4XAPPLECHARGER or the 4XIPADCHARGER. It makes it very convenient for you to charge your devices from any regular wall outlet. Our Apple compatible cables deliver dependable performance and durability with the reinforced molded ends to prevent excessive usage wear. Problem it solves: The 4XEM 15FT/5M Lightning cable for Apple 8pin Lightning devices makes a perfect high quality backup or replacement charge and sync cable for all your Apple 8pin Lightning connection devices. Changes things up with our Johnny Cash version black Apple cable and the added 15FT length is a definite bonus. When charging, or transferring data to and from any Apple device, always trust 4XEM Connectivity! 4XEM cables come with our unmatched Lifetime Warranty!